Provo Poetry connects the Utah Valley community to verse, one quarter at a time. At Enliten Bakery & Cafe in Provo, you can put a quarter in a gumball machine, and it will give you something to chew on—but intellectually, rather than physically. The unique concept of the "Poemball" machine—launched March 24—is the brainchild of Trish Hopkinson and Marianne Hales Harding, co-founders of Provo Poetry. Theirs is a quest, a couple of years in the making, to bring the art of verse into the Utah Valley community in a more visible way. For Harding—who teaches at Western Governors and Brigham Young universities—those efforts began in 2014, with the launch of the Speak for Yourself poetry open mic event at Enliten after she relocated to Utah County. "I had an experience with an open mic in St. George," Harding says, "and I knew they can be up and down in terms of attendance. So I was expecting to have a long, hard battle to get things up and going. ... But when we had our first open mic, we were packed. There was just this swell of writers who wanted this kind of community, and just didn't have a lightning rod to bring them together." That kind of community is crucial for writers, Harding says, because of the tendency of writers to be "alone in your head" so much of the time: "It's invaluable to have other writers to interact with. Your creativity is really sparked by, 'OK, let's all write about this.'" "Salt Lake County has a lot of really strong literary arts groups, and Utah County is really devoid of that," she says. Provo Poetry was launched in January of this year to fill that void—to connect not just poets with other poets, but poets with all of Utah Valley. 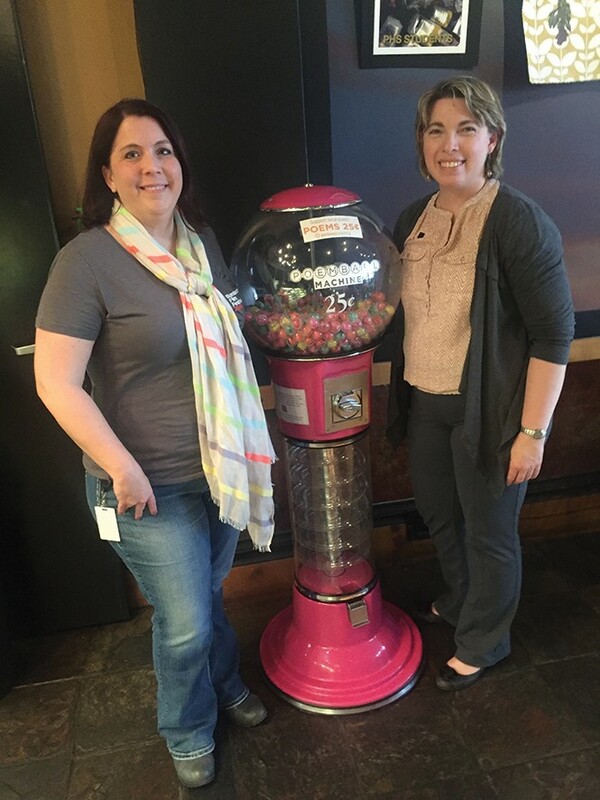 For now, that takes the playful and creative form of the Poemball machine: a standard old-school gumball machine which dispenses plastic balls containing original works from Utah poets including Rob Carney, Meg Day and Laura Hamblin. According to Hopkinson, the concept came from a much more pragmatic place than a burst of poetic inspiration: "Part of it was that Marianne actually had a gumball machine," she says with a laugh. Plenty of pragmatism was required for the logistics of the project as well. For example, the writers faced a word limit for their contributions, in order for the poems—a total of 150 for the first batch—to fit on the tiny pieces of paper that would be folded up inside the 1-inch plastic spheres. "It kind of helps in the end to have that kind of focus," Harding says. "There's only so much you're going to read standing in line to get your food." In part because of the public venue, Harding and Hopkinson requested in their call for submissions that the content for the Poemball poems be "PG or PG-13," but they're quick to challenge the idea that poetry in Utah County can easily be pigeonholed because of the area's heavily LDS demographics. "I think there's probably a preconception ... that there's not a diverse group [of poets]," Harding says. "One of the reasons that there hasn't been a consistent open mic in Utah County is that they're generally uncensored. And I feel strongly about the uncensored thing, even though I myself am a fairly conservative writer. ... You want to be aware of your audience, and it can be very alienating for a certain segment of your audience; we want to be inclusive. But we don't want to put artificial borders on creativity." "As the evening wears on, though," Hopkinson adds, "we cut loose a little bit more." Harding and Hopkinson have other concepts percolating for Provo Poetry—from a presence at Chalk the Block chalk art event in September, to putting poems on bags for Which Wich sandwiches—even as Poemball is just getting started. "There can sometimes be a perception of elitism [in poetry], Harding says, "that 'I'm not a literary person, so I don't want to get involved in that.' Poetry is for everybody. ... Anyone can find enjoyment with these kinds of things." It's an idea worth chewing over for a while.